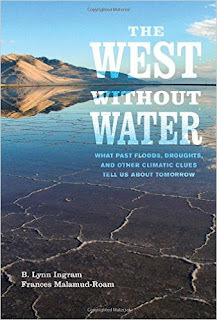 This is yet another California drought post, this one featuring a book by two women who know what they are talking about, that is, the climate of California since the last ice age. The idea behind studying the earth's past climate is that we might be able to see patterns that could help us predict climate in the future. Unfortunately, climate is capricious and the best that climate studies can do is to give us a smorgasbord of options. Our options for California are periods of benign climate interspersed with droughts and floods. California has been in a benign, wetter than usual period for about 150 years. That period may now be ending. The entire culture and economy of present day California has been built on top of the expectation that the past 150 years are what's normal for the climate of California. 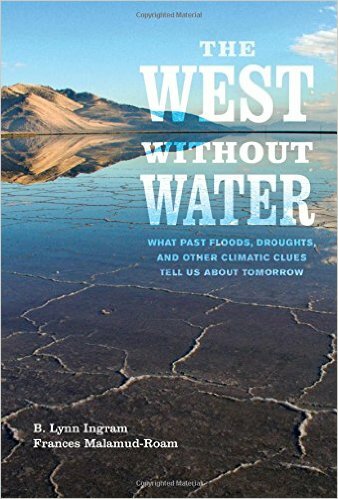 Sure there isn't enough water in southern California to support large scale agriculture and cities, but with dams and aqueducts, water has been brought from elsewhere to make life in southern California possible. Northern California fares a little better than the south but cities in Central California, like those that rim San Francisco bay have to import their water from out of the area. The truth of the situation is that California does not have enough water to support a population of 39 million people indefinitely. It has enough water if the climate is sufficiently wet. But it isn't always. There have been droughts that have lasted for 500 years, from AD 900 to AD 1400 for instance, much longer than California has existed as a state. The present culture of California could not exist in such a climate. Indian cultures have existed in all these varying climates but they were never as dense as the present population. They were also not as settled and had a better sense of climate variability than the people who built the present day California. For example, the Central Valley of California where some large part of the produce sold in the US is grown floods periodically. The Indians tended not to build permanent settlements there. They moved there when floods were not imminent and moved to higher ground when storms were likely. The current culture on the other hand has built cities and farms in this flood plain that gets flooded in excess of ten feet every hundred years or so. The last great flood happened in 1862. A flood of this magnitude happening today would destroy a good deal of housing and farms and also displace 6 million people. It would also very likely drown much of the infrastructure that brings water to Los Angeles, San Francisco and other coastal cities. So perhaps drought is not even the worst threat to California. Drought is a threat to agriculture in California but then agriculture in California was never a good idea unless one is comfortable with the idea that it might only be a temporary arrangement.